What We Do — Fireservice Disaster Kleenup Inc.
As the largest and most-trusted name in disaster, fire, and water damage restoration, Fireservice Disaster Kleenup has been helping families and businesses in Lee, Collier, Sarasota, and Charlotte Counties recover from the effects of flood, fire, water damage, mold, storms, and bio-hazardous emergencies for over 45 years. When the news is bad and you don’t know where to turn for help; you can depend on Fireservice to help make you whole again. Locally owned and operated, Fireservice is an affiliate partner of Disaster Kleenup International (DKI), one of the largest disaster restoration associations in the country. This partnership assures us of the ability to handle any issue. Whether it’s a leaky pipe or a Category 5 hurricane; Fireservice is prepared to restore everything back to normal. 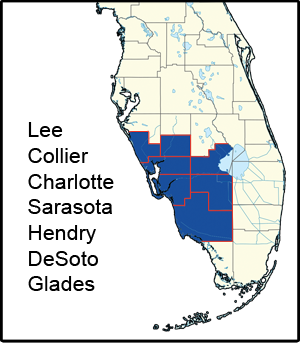 Emergency Service Area Including Naples, Fort Myers, Charlotte, and Sarasota. — A very satisfied and APPRECIATIVE customer, Jean K.